Wonderful contemporary mountain home nestled just behind the Maggie Valley Club! The home offers privacy, mountain views, & plenty of room for a garden. Each level offers its own master suite. Hardwood floors, granite tops, large kitchen island, & 2 fireplaces are just some of the features of this lovely home. 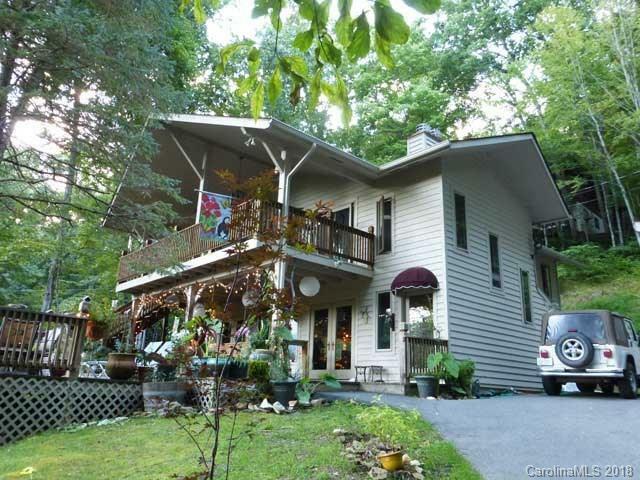 Great home for entertaining with huge lower deck & covered upper deck. Additional features include 1 car carport and 1 car garage, beautiful waterfall (man-made) that is lit up at night next to the stone firepit. Excellent rental history on this home. The sellers are willing to sell the home turn key (minus some personal items). Suitable for year-round use but if you are looking for an investment opportunity do not miss out on this one!